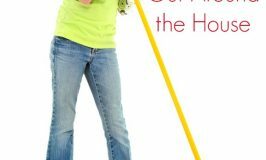 What do your kids know about being financially responsible? Do they get an allowance? Do they have a savings account? More and more kids these days are heading out into the world unequipped to handle the financial challenges ahead of them. I know, because I was one of them. Nobody taught me about the pit falls of debt, or the benefits of investing, or just simply how to save for a rainy day. I went out in life with no clue how dangerous financial ignorance could be. 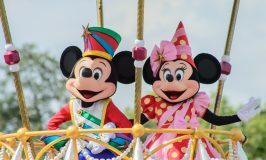 My husband and I got ourselves in financial trouble more than a few times and after being bailed out by our very generous family on more than one occasion, we knew something had to change. We started on a path to financial independence, we started saving and paying off debt and came up with a reasonable budget. We had to make some big sacrifices, like selling my husband’s car and relying on only one car that we shared. It was hard, but completely worth it. We are finally in a place where we feel secure and prepared for any emergency that may come up. It is incredibly important that our kids don’t repeat our mistakes when they are ready to leave us, so we are doing our best to prepare them for real world money scenarios. Here are 5 lessons that we have learned are crucial for successful money management. Kids rarely have to wait for anything these days. They have almost instant access to information, TV shows, books, music, etc. Unfortunately this has translated into an “I want it now” mentality. Curbing this tendency early by teaching them to wait for things they really want is a critical tool for financial success. This is one lesson that most people seem to want to skim over, after all, how does giving my money to other people help me be more financially responsible? The fact is, that financial responsibility isn’t just about you, sometimes it’s about using what you have to help others. 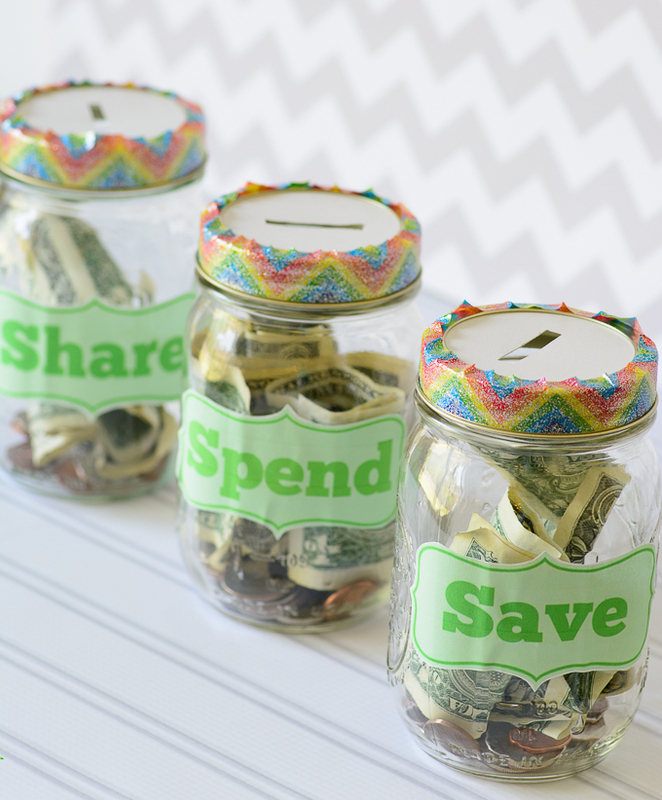 We have created these Save, Spend and Share jars that the kids use to allocate their money. We have a rule that at least 30% goes to savings, 10% goes to sharing and the remaining 60% can go into the spending jar. 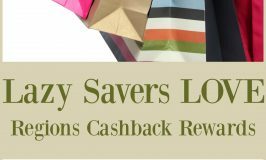 They can always add more to savings and to sharing, but never less. At the end of the month, they pick a charity they want to donate to. Allowing them to pick a charity keeps them involved and lets them see where their money is going, even better if it is a local charity and they can deliver the money in person. 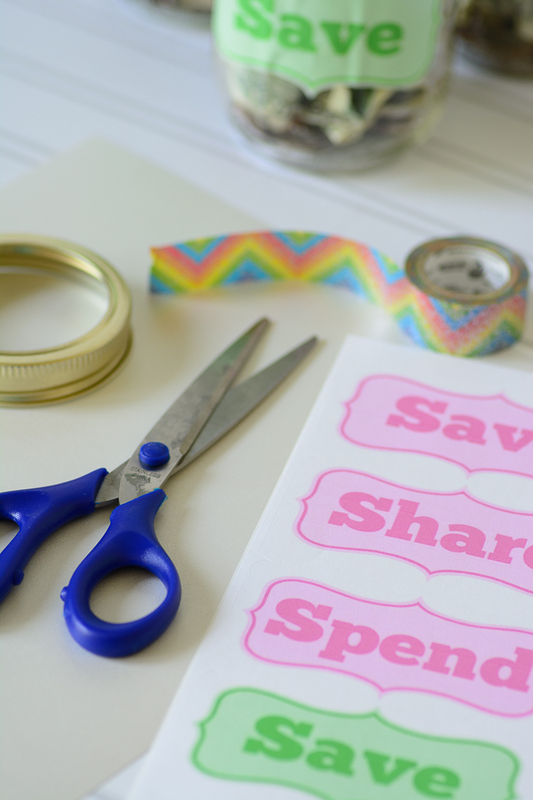 Our Save, Spend, Share jars are super easy to make! All you need is a mason jar (with metal lid), some card stock, washi tape and these labels. Use the metal lid to trace a circle on the cardstock. Cut the circle out and then cut a small slit in the middle, make sure it’s long enough for a quarter and thick enough for a folded dollar bill. Line the metal ring with the washi tape, cutting off any excess. place the cardstock lid on the jar and then screw on the metal ring. 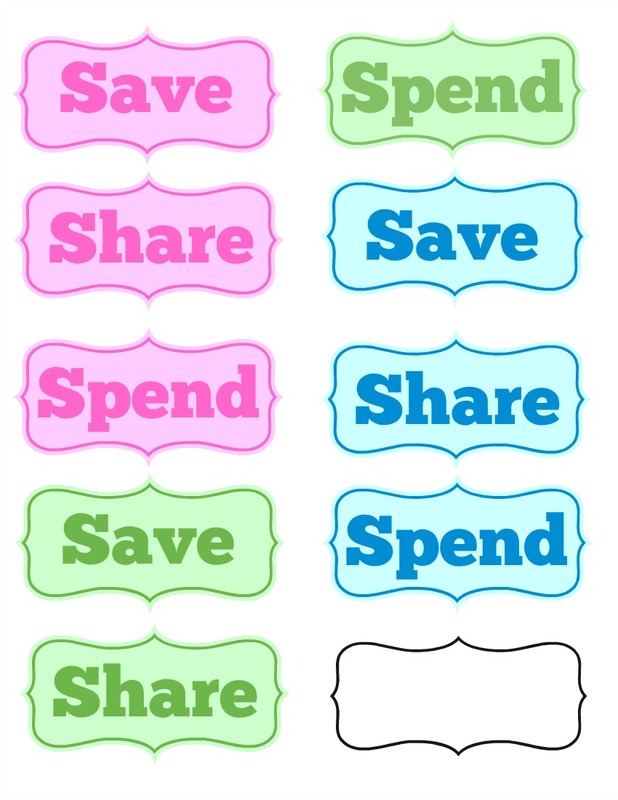 Add the labels in the color of your choice and that’s it, you now have cute Save, Share, Spend jars! A savings account is key for financial success. 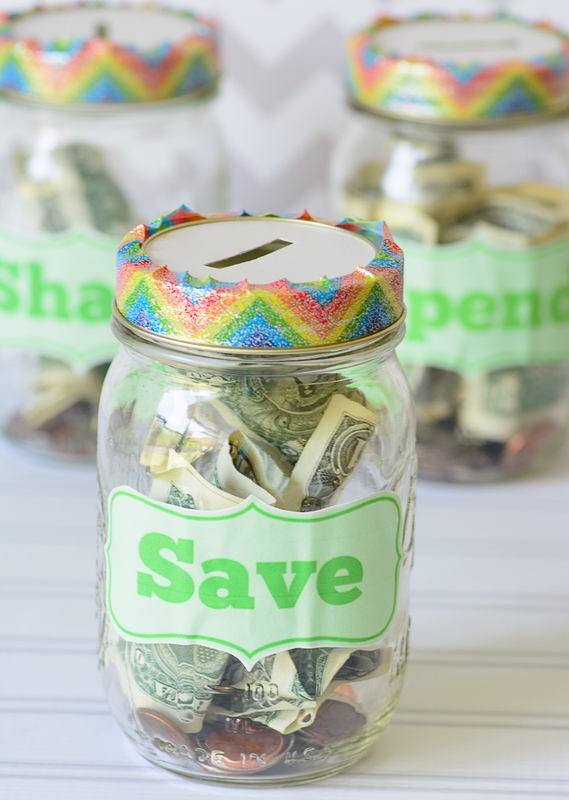 At the end of the month we put the money from our kids Save jar into a savings account. This is money that they are saving for the big things they want like a new phone, gaming console, or in the case of my 15 year old, a trip to Europe. Choose a savings account with a high interest rate so the kids can see that you can earn money just by letting it sit in their savings account. In my opinion nobody can be financially successful without a well thought out budget. Budgeting doesn’t always have to mean cutting out the things that you love, budgeting is more about making a financial plan and sticking to it. The best way to teach kids how to budget is to include them in yours. By including them in budget planning, they learn that money isn’t infinite, there is only so much to pay for food, shelter and entertainment. You may even be surprised by how they make efforts to save your money when they see where it all goes. 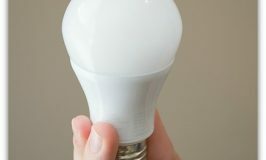 My kids are more diligent about turning off the lights when they leave a room, how much water they use and how much food they waste now that they see where all the money goes. In our family, we don’t give an allowance. The kids have to earn their own money, just like it is in real life. Everyday they have their “citizen” chores, these are the chores that are a daily part of life. Making your bed, cleaning your bathroom, washing your dishes, etc, are all citizen chores, they don’t get paid for these chores. However we do have a work for hire board. On our work for hire board we have jobs that can be done to earn money. Some examples of the jobs that can appear on our board are, weeding, cleaning baseboards, vacuuming stairs, washing the car, etc. When they have to work hard for money they are less likely to spend it frivolously. Teaching your kids how to manage their money is one of the most important things that you can teach them. Be proactive, don’t just assume they will figure it out. 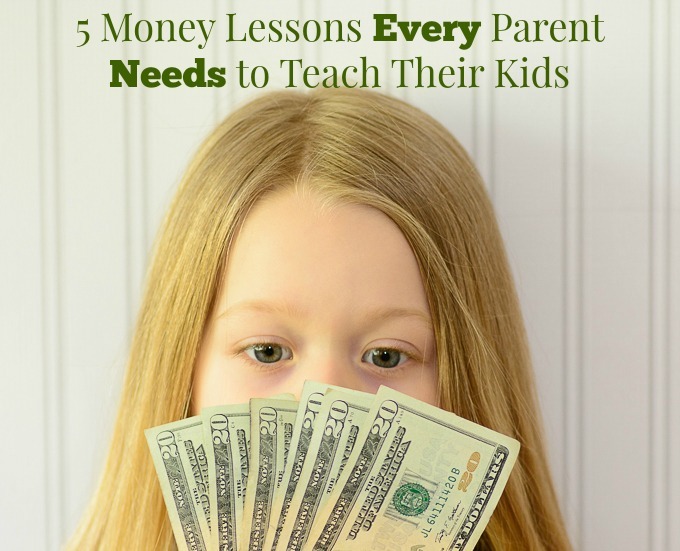 For more information on helping your children navigate the waters of financial responsibility, you can visit this awesome Teaching Kids About Money article from Protective financial. What is the one thing that you will teach your children about money?